I've been keeping something under-wraps for over a year I have a great man in my life . We made our one year mark a couple months ago . Our relationship is far from perfect but he's perfect for me . Our relationship has taught me so much over this year . Tired or not I make sure I see him when I can . I know he wont always be available because he needs to study and rest . I've learned so much patience from that . He has taught me how to communicate more . he would rather hear what I'm thinking good or bad. I've never felt so open in a relationship . I love that we can be so open with one another . In the beginning of our relationship I let past experiences cause problems between us. past to truly allow him in especially if I wanted this relationship to work . Distance couldn't hurt what we have . It all goes back to the communication and trusting your partner . I'm not one who wants to wined and dined all the time . I love a movie night in the house watching a good movie on Netflix and eating some good food . Cherish those little moment in bed just talking , cuddling and connecting . As you all know I love my makeup but its not always needed . I have my good and my day just like he do . I know sometimes my problems isn't that important ( a crazy customer ) versus him not feeling confident about a upcoming test . I'm his biggest cheerleader I always want to uplift his spirits and reassure him of the amazing things he has done and will accomplish as he does for me . To be able to grow together is an amazing thing . 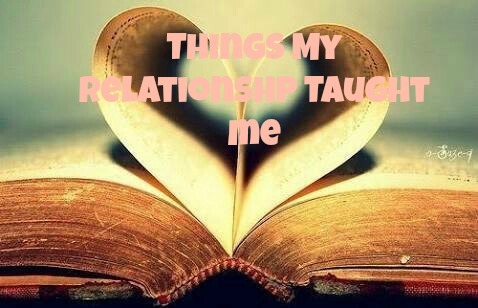 What have your current and past relationships taught you?